Quickly browse Sarasota golf condo communities below. Just click on a condo's photo or title to view the current condos for sale, and also learn more about that particular condo community. * We strongly advise verification of all website info prior to any purchase decision, as info can and does change. Amenities: Maintenance Free Villas, Close To Palm Aire Country Club With Golf, Restaurants, Tennis, Heated Pool. Maintenance Includes: Cable, Escrow Reserves Fund, Ground Maintenance, Insurance Building, Manager, Pest Control, Private Road, Public Insurance, Roof, Trash Removal. Water Views: No Lake Views. 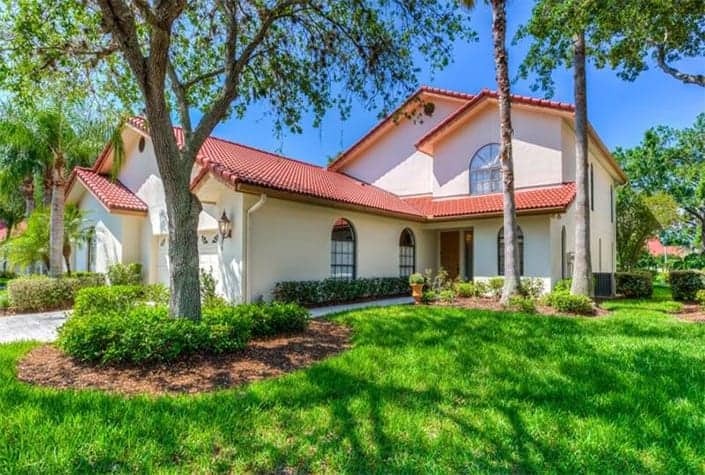 Palmer Ranch Golf Course Condos For Sale | Sarasota, FL. Maintenance Includes: Varies By Condo. Water Views: Some with water views. Palm Aire Golf Course Condos For Sale | Sarasota, FL. Meridian At The Oaks Preserve Condos For Sale | Osprey, FL. Maintenance Includes: Building Exterior, Cable, Community Pool, Escrow Reserves Fund, Fidelity Bond, Flood Insurance, Ground Maintenance, Insurance Building, Maintenance/Repairs, Manager, Pest Control, Private Road, Recreational Facilities, Roof, Security, Trash Removal. Water Views: Many with water views. Lakewood Ranch Golf Course Condos For Sale | Lakewood Ranch, FL. Maintenance Includes: Varies By Community. Water Views: Many with lake views. Fairway Gardens Condos For Sale | Bradenton, FL. Amenities: Clubhouse and grounds with Restaurant, Heated Pool/Spa, Fitness facility & Tennis Courts. No CDD fees. Mandatory monthly golf fees. Rolling Green Condos For Sale | Sarasota, FL. Amenities: Community pool, hot tub, 55+ community, gated. Maintenance Includes: Community Pool, Ground Maintenance, Insurance Building, Maintenance/Repairs, Public Insurance, Roof. Water Views: Some lake views. Maintenance Includes: Building Exterior, Community Pool, Escrow Reserves Fund, Ground Maintenance, Insurance Building, Maintenance/Repairs, Pest Control, Private Road, Roof, Security. Amenities: Gated Community, Golf Community, Maintenance Free, Recreation Building, Storage. Maintenance Includes: Building Exterior, Ground Maintenance, Insurance Building, Roof, Trash Removal. Water Views: Large Lake Views. See the great deals we uncover & watch Bill's 3 minute local real estate market video update.